What a great weekend. It started with a thankfully uneventful drive down to philly accept for a sudden torrential downpour at the end. We got to my parents house at around 9 pm. We were really psyched to see the makeover they did to the new house since they moved, back in January. 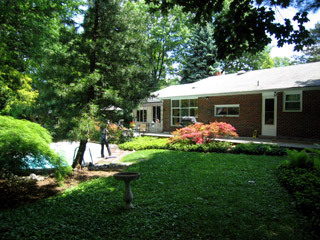 The place looks amazing now with a new family room, new landscaping and a newly cleaned and painted pool. new crazy terms that are required to navigate the current TV market including: HDTV, HDMI, DVI, DLP, LCD, D-ILA, LCoS, ATSC, composite, component, interlaced, progressive. I thought the best tv, size-wise and quality-wise for the best price was going to be one of the rear projection TVs like DLP or some variation of that. I had a specific model chosen, and had called the local Best Buy to be sure it was in stock. During the tv debate there was a clear division on size. Mom wanted something small and definitely flat panel, something about an obnoxiously large piece of technology didn't fit in with the french country style she was going for. The others including Ruby (that's my girl) seemed to be of the opinion bigger is better. We were looking for something that would be clearly visible while floating in the pool in the backyard. 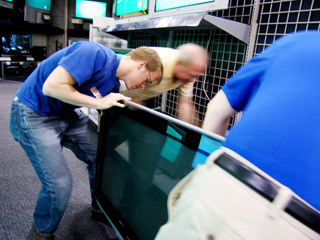 We agreed to go to Best buy the next day and get a better look at the 52" monstrosity that I was recommending and that night I did a little more research on flat panel tvs. Saturday morning we able to fully appreciate the landscaping in the front and back. Years of undergrowth had been removed to expose cool little paths that weaved in and around all the unusual trees, plants and the pool. It was more like a nature exhibit than a backyard. Having had enough nature for the time being, we decided to postpone the outdoor art exhibit we had planned to go to, in order to get to Best Buy early. No, it's not sad. At Best Buy we could finally see the TV I was talking about. Man, it was big. Not crazy big, though, I could definitely handle it and I think it would have fit in their room okay, but it was big enough for mom to immediately turn around and start looking elsewhere. I found conversing with the Best Buy employee rather easy as I had the new vocabulary down. We spread out and started looking at all the tvs. We settled on one that seemed an excellent combination of size, quality and price: a 42" Plasma HDTV by Panasonic. It was discounted because it was the floor model and we had an additional coupon making it an awesome deal so it turned out to be actually cheaper than the 37" model right next to it which Mom had been hoping for. It has all the latest connections on the back. In addition, I convinced them their DVD player had to be upgraded to take advantage of the HDMI connection. Everything worked out rather well, except they couldn't find screws for the stand, after 45 min of searching we left without them. best buy seems to have a policy that whatever monetary deal you get out of them they need to make up for it with your time. After a nerve racking drive home we set up the TV and new DVD player and popped in Blade Trinity. The picture was incredible and the size worked really well for the room. I think the flat panel choice was a real good one. Of course we couldn't get Cable to work and I still don't know why, but the Best Buy warranty will ensure the problem is taken care of, or they get a brand new model. As we planned on seeing episode III the following day later that day we picked up Star Wars episode II and Clone wars. We were particularly amazed at how good Clone wars looked on the large screen. Sunday morning we woke up and got to see the beginning of filling the pool, which we then continued to watch all day long. 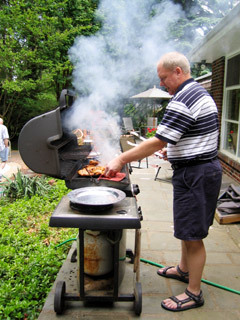 Mom and Dad had a barbecue with yummy pork, chicken, burgers, hotdogs, and sausage. Our grandparents and Greg and Jean came over. It was a relaxing day of eating, talking, and watching the pool fill. Ruby and I got the usual questions of what are we going to do and where are we going to live. At least Pop pop reassured me that I won't have to worry about money in the future because I should be making 3 figures when I graduate. At 8:30 we went to see Star Wars Episode III. It was my parents first time, Cliff's second and our third. Everyone pretty much liked it. Although mom and dad both seemed to notice the decline in importance of Padme. From queen to senator to pregnant housewife. Barring that, I think it gets better each time I see it. Especially because I can ignore lines like "No, it's because I love YOU so much" and instead concentrate on good lines like "I have failed you Anakin" and anything said by Palpatine. Monday morning we woke up and finally went for a walk in nearby Alverthorpe park and checked out the outdoor art exhibit at the abington art center. I hadn't been there in 15 years so it was really cool to see. When we got back to the house, the weather was great, the pool was full, sarah went out sunning herself (as she was for most of the weekend), and it was time for us to leave. I said goodbye to the pool and television, promising I would be back soon. Then we said goodbye to the family and headed north.